OCHOPEE, Fla. – In the middle of Big Cypress National Preserve, a 729,000-acre space that houses tropical plants, manatees, the Florida panther, foxes and birds — lies a fairly small periwinkle building that hundreds of visitors stop by each year. To a passerby, this building looks like an average-sized house — there is nothing intriguing about it. But the minute you park and explore the area, you’ll realize that it isn’t just an ordinary building. It is the new Big Cypress Swamp Welcome Center, which is full of information and exhibits. 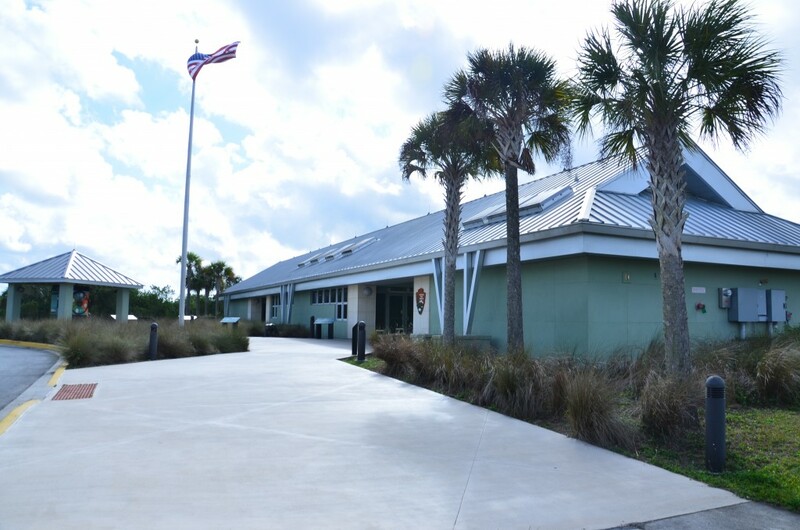 The environmentally friendly building was built from the ground up in March 2010 after the Big Cypress management team realized that one visitor center located on the East side of the preserve was not enough. Click on the video at the right to view a slideshow about the new Welcome Center prepared by writer Elizabeth De Armas. According to Bob DeGross, the chief of Interpretation and Public Affairs, the new visitor center was built primarily because many tourists traveling from the West to the East had no place that would inform them of things to do along the way. “It was primarily just to capture those visitors coming from the West to the East so we could provide them with information about opportunities within the preserve as they continued to the East,” DeGross said. Before the Swamp Welcome Center was created, the Oasis Visitor Center on U.S. 41 was the only spot tourists could stop at to figure out what there was to do at the preserve. However, the Oasis Visitor Center was far to the east side of the preserve, and a lot of opportunities at the park are found on the West side. The Big Cypress Welcome Center is located just off U.S. 41 (Staff photo). The retrofitted Oasis Visitor Center was created in the 1980s making the exhibits seemingly outdated, especially with the advancement of technology in recent years. However, the new Swamp Welcome Center has not only incorporated technology into their exhibit areas, but also made it an orientation center to “all of the public lands within the Big Cypress Swamp,” DeGross said. There are two main exhibits at the Welcome Center that fuse audio and visual technology to create an amazing experience for first-time visitors. The first exhibit is found just outside of the entrance to the air-conditioned part of the visitor center, in one of the breezeways. The alligator is one of the many animals found in the Big Cypress National Preserve. From the boardwalk of the Swamp Welcome Center, visitors can see these creatures in their natural habitat (Photos by Elizabeth de Armas). This is the Big Cypress Watershed exhibit, which allows individuals to learn about how the water flows from the Big Cypress through Florida. The best part — it is an interactive exhibit. Individuals can pull on a handle and watch water flow as it does on a daily basis in the ecosystem. But, DeGross said the exhibit he sees most visitors taking advantage of is the night sounds exhibits, which allows people to hear how certain animals sound when industrial noises are not shrouding over the noises of nature. Click on the audio bar above to hear a sample of the night sounds exhibit. From the boardwalk of the Swamp Welcome Center, this is the view that visitors get of a manatee that has just come up for a breath. The water at the Welcome Center is clear enough that spotting manatees is easy and fun. These two exhibits are just a couple of the exciting opportunities readily available to tourists, natives and visitors coming through the welcome center. Outside of the visitor center, the first treading machine is displayed and inside the visitor center, a display shows what ranger uniforms used to look like. Around the center there are also different stations, which includes a station about the Florida panther, a station about the sensor cameras placed throughout the preserve, a timeline outlining the Big Cypress history and a map. A mini gift shop also allows visitors to by snacks, soft drinks, water bottles and souvenirs such a t-shirts, books, patches and postcards. And, the environment was kept in mind during the building process. Although the center itself provides visitors with many unique opportunities during the peak tourist season that runs from November to March, the Welcome Center’s boardwalk is the spot to visit. Why? Manatee season. During this time, it is more than likely that visitors will spot up to three manatees in one hour. And, that is a site to see. On the boardwalk, park rangers give 10 to 15 minute talks about Big Cypress National Preserve and the manatees. The Swamp Welcome Center houses many butterflies, including the Monarch butterfly, which is pictured here drinking nectar from a flower. There is a grassy area near the parking lot where butterflies can be seen. Andrew Friedner, a national park ranger, said there is no other place in the world that visitors can get versatile experience, other than Big Cypress. Jennifer Marie, a visitor from New Jersey, agrees with Friedner’s rhetorical question. She said she has been able to see more at this visitor than she has been able to see in a lifetime. DeGross said that he hopes people who visit the center will learn about the swamp and the different management issues affecting the swamp. The Swamp Welcome Center is staffed with rangers and faculty who are knowledgeable about the preserve and can also answer any questions that visitors may have. Bring your camera because there are many photo opportunities. Make sure to wear sunscreen.